Some locals came to our camp this morning and gave us some eggs, which we boiled for lunch. We gave them some t-shirts and some aspirin (they complained about various maladies, apparently thinking that all white people are doctors) in return. We departed at about 830am with Rafiki towing the Pinzy. The road at first was good and we were able to make about 60 km/hr. It soon deteriorated though, and we slowed back down again. We stopped at 11am to change tow vehicles and were able to spend the last of our Kwanza on fuel so we could enter Namibia with as much cheap Angolan fuel as possible. Toki took a turn at towing, and just before the Namibian border Sid took over again. We hit good road at Ondjiva and made it to the border by 3:30pm. We went through Angolan and Namibian customs and immigration and left the border area at about 5pm. Knowing there was a commercial camp ground in Ondangwa, we decided to press on and found the campsite by 6pm. The transition to Namibia is shocking. Shops and grocery stores, good roads, ATM machines, functioning traffic lights (and drivers that obey them!) and good roads all make it seem as if we are back in the developed world. We feel like we have successfully completed our goal of crossing Africa by road and had a celebratory dinner at the campground restaurant. We enjoyed steaks, good South African wine, and beer, and even ice cream and Don Pedros for desert. Our rashes are still there, although everyone is getting better except Witt, whose sore behind his knee is making it difficult to walk. There are two doctors offices near the campground that we will visit in the morning. Witt and Graham visited the nearby pharmacy this morning, hoping to sort out their rashes. The pharmacists here are empowered to prescribe medications and actually receive more training than the doctors. She looked at our maladies and prescribed “bactoban” which seems to be a generic anti-bacterial skin cream. This is simple and easy, not to mention much less invasive than amputation, and we’re hoping it works. Next we went to Oshakati to visit the internet café and shop for food, which we desperately need after finishing nearly all of our reserves in Angola. The internet café had only one functioning computer, and even after connecting Graham and Vicky’s computers to the network, it took all morning to get all of us some time checking their email. Afterward we went to the much-touted Nandos, a South African fast food chicken chain for an excellent lunch. Next we went to the shopping center and visited “Game”, a small version of Wal-mart, and afterward the “Pick-n-Pay” for groceries. Shopping for nine is always an adventure, and three hours later we emerged with two shopping carts and $200 worth of food. 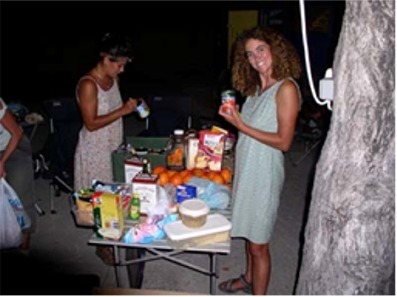 The early evening hours was spent dividing and stowing the food in the cars. Graham cooked the boerewors (sausage) on the braai (grill) and Urs made rosti, a swiss fried potato and onion cake. Together with Elza’s salad, we enjoyed yet another wonderful meal. Nadine and David have re-joined us following a beautiful drive down through Ruacana. Graham and Connie tag-team flip the Boerewors. Don’t try this at home. We had all planned out to go and find the Laundromat which we have heard was in town. Jen, Krissy, and Connie emptied out the back of Rafiki and stuffed it with their washing and headed off. They had difficulty locating it and stopped at a Shell gas station for directions. Krissy hopped out leaving Jen and Connie in the car. A couple of guys approached the driver’s side of the car and started talking to Jen. In the meantime, Connie noticed another guy at the passenger window reaching into the car. In an instant he grabbed Krissy’s shoulder bag and was gone. Connie leapt out of the car and started running after him, shouting “stop thief!” Virtually all of a nearby market emptied out as people started running after the thief. Before the chase began, he had had the time to open the bag and empty a wallet of cash. He ditched the bag and threw the wallet to one of his accomplices. The thief escaped with the cash while the other two men, who had Krissy’s wallet, were apprehended by the police. Meanwhile Jen tore off in Rafiki in pursuit of Connie and the crowd. Krissy emerged from the gas station in time to see Jen drive off in a cloud of dust and knew that something was up. She heard two gun shots and ran in the direction of crowd to find Connie. The gunshots were the police attempting to stop the thieves. Someone returned Krissy’s shoulder bag to her and the police gave her the wallet. Jen came back to camp to retrieve Slade, who went to the scene with her. Jen, Krissy, Connie & Slade, along with one police officer, all piled into Rafiki and they drove to the police station. They spent about an hour giving statements, and the two accomplices will spend at least the weekend in jail. A couple staying at the campground (who have also lived in Namibia for a long time) told us that crime is rife in the area, and that we need to always keep our guard up. David and Nadine reported a similar attempt to rob them in Oshakati yesterday. The experience has rattled the whole group. We felt so relieved to leave the “dangerous” section of the trip and enter Namibia, where tourism is well established, but the fact is that we are probably in more danger here from petty theft than we ever were in the Congos or Angola.